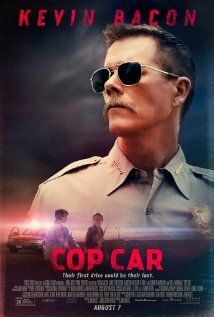 Movie Review: I wonder how great could “Cop Car” have been if thoroughly put together and well concluded. Director Jon Watts, who co-wrote with Christopher D. Ford, didn’t know how to give the best sequence to a riveting first part where the film straddles between a rebellious teen misadventure and a sort of cat-and-mouse road thriller. The story focuses on two 10-year-old kids who set off for a walk throughout the immense surrounding fields of a small city, just to find a tempting and yet hazardous plaything: an abandoned police car with the key and guns inside, and a beaten guy stuck in the trunk. The car belonged to the disreputable sheriff Kretzer, played with a distinguished firmness by Kavin Bacon, who only wants to retrieve his car. For that, he will have to chase down the kids, now turned into reckless speed drivers, wherever they go. Regardless the trivial plot, which in any occasion satisfies completely, Mr.Watts was able to gear an attractive pace boosted by the energy of the two promising young actors, James Freedson-Jackson and Hays Wellford. Even enriching a few passages with refreshing doses of black humor, the film’s issues are maintained along the fabricated excesses of its plot, aggravated with a despicable finale that makes us think about the absurdity of the whole situation. This leaves us destitute of something palpable at the end of the overfamiliar third act, time for the usual shootouts and car chases. The tensest moments were designed when the kids play with the guns, putting us in an incessant state of alert. As for the rest, “Cop Car” brings nothing new, consisting in a mediocre course of events that keeps oscillating between favorable and fatal. With this being said, the last thing I want is to discourage Mr. Watts, who showed capabilities as a filmmaker. Maybe with a tight screenwriting, he might conquer something more than a few grins when presenting some of his strenuous scenes.